Seisan is the most known Kata of Okinawa Karate-Do. Seisan is practiced in different styles : Goju-Ryu, Chito-Ryu, Shōrin-Ryu, Shito-Ryu, Meibukan, Wadō-Ryu and Uechi-Ryu. Why Seisan is so famous ? Seisan literally means ´Thirteen’, it can refers to 13 fights, 13 steps, 13 hands, 13 techniques or thirteen year old. Indeed 13 year old was the maturity in Ryukyu Kingdom that could explains that Seisan is used for Shodan graduation. 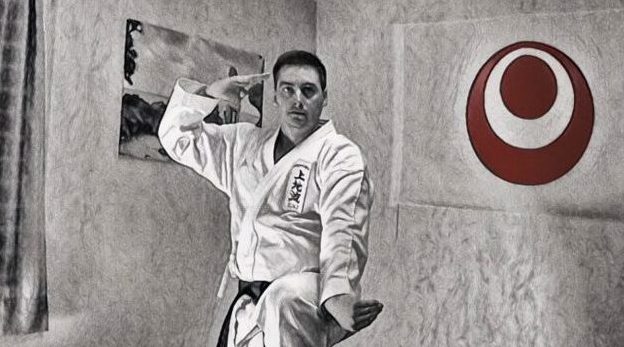 When you gain shodan rank, you master the basic of your style so your are a mature karate-ka. In the school of Uechi (or Uechi-Ryu) seisan is the colarbone of the style. Thus kata is one of the 3 chinese native Pangainoon katas brought by Kanbun Uechi from Fujian. Seisan is using all the techniques used in Sanchin plus additional ones such as nukite, Shoken Zuki, Empi, … That’s why most of Black belt students are spending their time to train carefully Sanchin Kata. In Modern Uechi-Ryu we’ve got 3 additional katas from Pangainoon : Kanshiwa, Kanshu, Seichin (between Sanchin & Seisan). Having studied them and started to ‘Master’ their form the student has learnt new techniques and new stances with Seisan, it’s now the time to put in application all the techniques learned. That the most striking stance in the Seisan Kata and something called as exotic for Shotokan practitioners. Tsuru Ashi Dachi is a kind of iconic stance for Okinawa Karate-Do also called white crane stance. This stance is used twice in Seisan the first one at the end of the first line before koken technique and at the end of the kata with a rear jump and double blocks.